Part of the appeal to the prince + pete brand is that you can buy in either 3, 5 or 9 packs, singles or the vip S-Club (we like how that sounds!). Each pack is centered around a color theme, all creatively named, from which your styles are selected, allowing them to be tastefully interchanged within the same theme. So you can choose to go traditional and match your socks exactly, or mis-match a bit! It sounded like fun to try out the subtle mixing of patterns, so we took a pair out for a spin, and loved them! We hope you'll enjoy these photos we took down by the pond; it was a bit chilly that day, but luckily, the socks kept our brave model's feet warm! These socks are actually a little thicker than traditional men's dress socks, and we liked the extra comfort. The blues and subtle, yet still conversational patterns, matched so well with the scene, we couldn't have been more pleased. The prince + pete logo appropriately displays a motto of "the art of interesting feet," which we think goes well with the concept. If you're ready to get your own prince + pete look, we encourage you to check out their website and shop their combos. We love that each color theme offers a tasteful ground color to match well with your dress or casual wear. We are also proud to announce that we are running our first ever sock giveaway contest, prizes courtesy of prince + pete!! Ready to win? 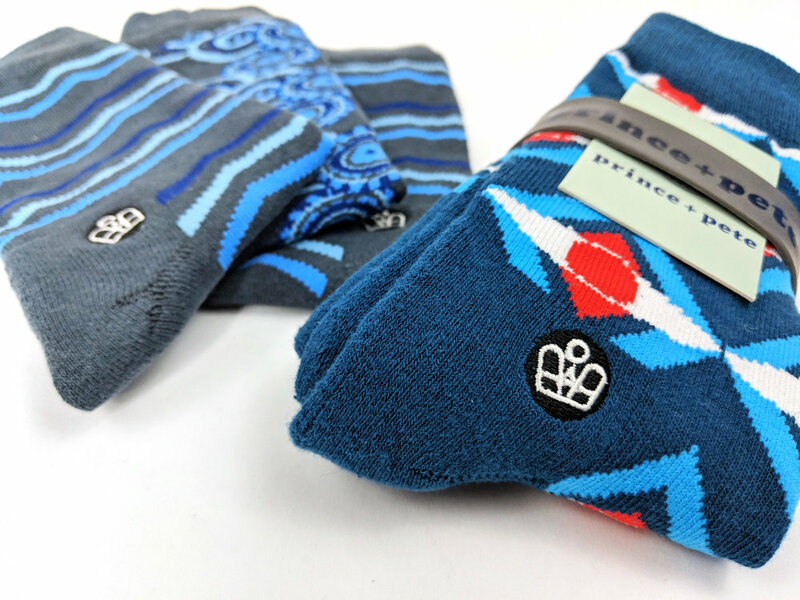 Then, head on over to Instagram and follow @thesockreview for details on participating, and be sure to give @princeandpete some love there too! Disclaimer: The Sock Review was provided a free product in return for an honest review. All thoughts and opinions expressed herein are my own and not influenced by the developing company, and/or its affiliates, in any way. All photos and written content on this site are the property of Jess Doutrich, unless otherwise written copyright 2019.